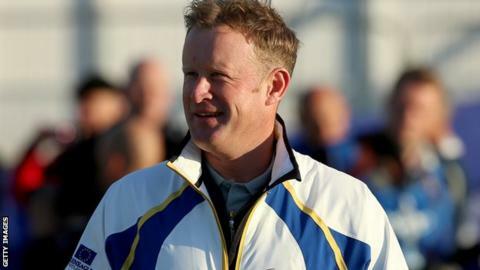 Ryder Cup rookie Jamie Donaldson has sought advice from countryman Philip Price ahead of his debut against America at Gleneagles. Price, the last Welshman to play in the Cup, secured a shock singles win over Phil Mickelson in 2002. "Phil said 'just go out and enjoy yourself'," revealed Donaldson. "He said it takes a while for the golf to get going and then it goes very quickly, so enjoy your time and go out there and give them hell." Donaldson, who has only ever seen the Ryder Cup on television, is excited to be part of the biggest week in golf. "The whole occasion is just huge," said the world number 29. "It's getting to your room and seeing that huge clothes rail with all your outfits lined up ready. It's just an incredible experience. "The lads are all very relaxed. There is a lot of camaraderie between the guys. It's good fun. It's a lot of banter. "I played table tennis against Thomas Bjorn, he beat me 3-0. It's very relaxed - everybody's mixed in really well." Donaldson, 38, secured an automatic place on Europe's team for the match against USA by winning the Czech Masters, one of his three wins on the European Tour during 2014. But the Pontypridd-born golfer admits taking his place on Team Europe has been a long time coming. "I'm very happy to be here and looking forward to the challenge that lies ahead," he said. "It's amazing how well you have to play to get in this team. It took until the last event, nearly, to get in. "It's taken a long it time. It's been a grind - I've played well for a couple of years." Donaldson was glad to get out on the PGA Centenary course on Tuesday to assess the conditions ahead of the opening day on Friday. He practised with experienced pair Lee Westwood and Thomas Bjorn as Europe warmed up with a relaxed round in threeballs. "We had a whack and saw the course - where we need to hit it, [and the] firmness of the greens etc," said Donaldson. "It's great to be here. It's great to be back at Gleneagles."